Startup growth in the world is increasing, and each other is competing to make their company the best. Every region in the world has the prominent startups, as well as in the Asian region. That’s why the New Entrepreneurs Foundation (myNEF) – a non-profit organization that focuses on creating and developing sustainable entrepreneurs – celebrates the spirit of innovation and entrepreneurship in the Southeast Asian startup ecosystem by holding the ASEAN Rice Bowl Startup Awards. What is The Rice Bowl Awards? The Rice Bowl Startup Awards are the official Southeast Asia circuit for the Global Startup Awards. The Awards are divided into several rounds – nationals, regional and global. This year, the regional (South East Asia) reward innovation, excellence, and best practice in startups across the region. From all over Asia, there were 2500 startups listed in Rice Bowl. From Indonesia only, there were 280 submissions – including DycodeX. One interesting point from this year’s ARBSA was from 9 countries that entered the nomination, there were 6 female founders who became the winners. Miss Lyliana, CEO of myNEF explained during the ARBSA 2018 Indonesia Awarding Night in Jakarta on October 5, 2018, that Rice Bowl is not a pitching company because according to her, what often becomes the winner in the speech competition usually sounds good, but not as good. So it would not be fair for the Asian companies that have good qualities but are limited to language and presentation constraints. As one of the finalists of ARBSA 2018, DycodeX actively participated in promoting the event. If you follow our social media you would notice that at the end of September to early October, we shares a voting link so that the public can participate in choosing the best startup according to them in several categories. But voting is not everything. It’s just a way to move up the ladder. In fact, voting only affects about 10-15% of the total assessment. The criteria for the finalists of ARBSA are startups that stand less than 5 years, and the judges will make the assessments. The Indonesia winners will meet other South East Asian winners in Bali this November to secure the position as Asean Rice Bowl Awards 2018 winner, and later will go to the Global Startup Awards competing the other startups from teh Nordic, Central Europe, Africa, and other regions of the world. We would like to thank the Rice Bowl for giving us the chance to compete and hopefully we will come back next year to get the best categories and ready to compete with global startups. And thank you for all of you who had voted for us. 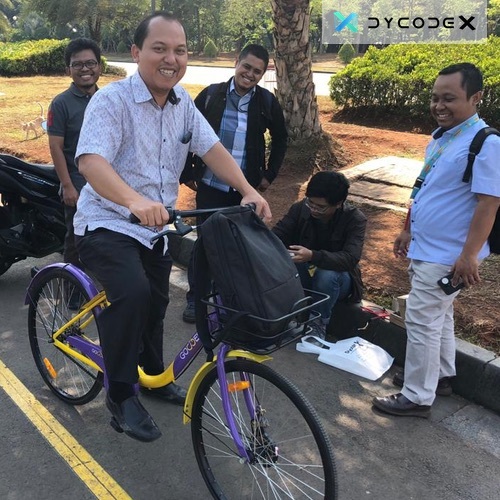 DycodeX will continue to do our best and drive to give us the best for Indonesia tech startup ecosystem.